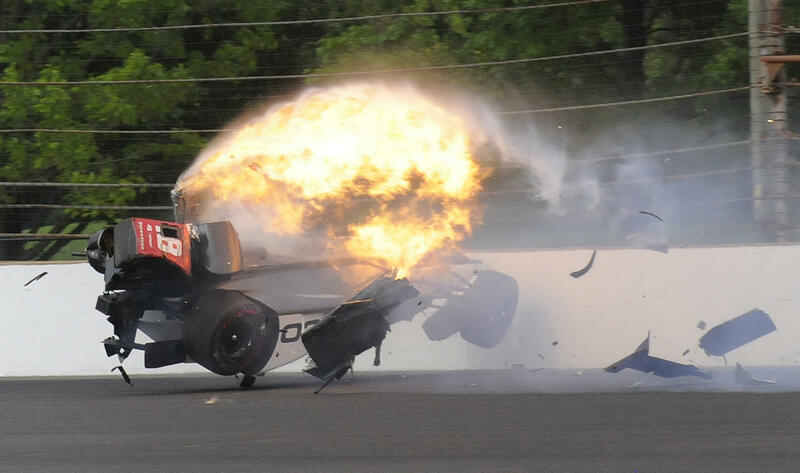 INDIANAPOLIS -- Sebastien Bourdais will have surgery Saturday night to repair a fractured pelvis suffered in a fiery crash during Indianapolis 500 qualifying. Track officials said doctors at Indiana University Methodist Hospital reported that the 38-year-old has multiple fractures in his pelvis and a fractured right hip. Team owner Dale Coyne said in a statement that Bourdais is "in good hands" at the hospital and that the team must wait for him to recover. He was injured when the No. 18 car wiggled in the second turn, slid up the track and slammed head-on into the second turn wall. The car then flipped over, with flames and smoke billowing out, before skidding to a stop in the back straightaway. Safety team members spent about 10 minutes getting Bourdais out of the car before putting him on a backboard. Track officials said he was awake and alert when he was transported by ambulance to the hospital. They said he never lost consciousness. Bourdais had just completed two laps over 231 mph - the fastest laps of the day - when the car started to spin. He won the season-opening race at St. Petersburg, Florida, and had the fastest time in Friday's practice. Bourdais won four straight Champ Car season titles from 2004-07 and raced in Formula One in 2008-09. He's sixth on IndyCar's career victory list with 35. Coyne will have to find a replacement driver for the May 28 race, but may not have to make the decision before the second round of qualifying is held. Because only 33 cars are entered for the 500, any that do not qualify will be sent to the back of the field and will be arranged based on entrant's points. One other driver, Zach Veach, also did not qualify Saturday. Veach crashed in practice earlier this week.